The picture shows the materials that come with this kit as well as a finished doll. The doll shown was my prototype and her name is Amanda. This timeless doll was probably made from bits of cloth salvaged from the scrap basket. 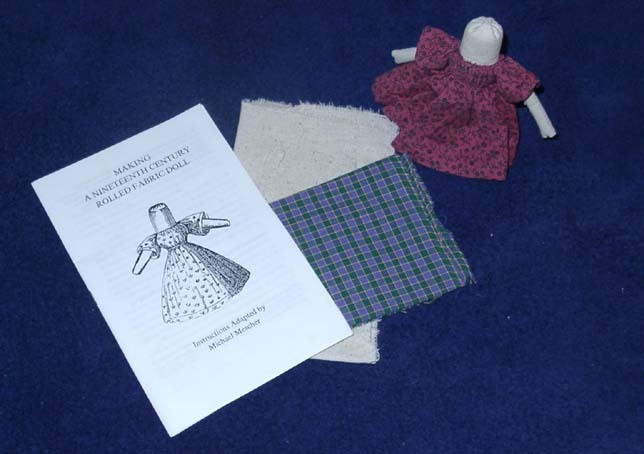 We have seen rolled fabric dolls made in similar patterns to these, most notably at the Mordecai House in Raleigh, NC. Also, in the book The Children of Bladensfield, which describes the experiences of several children growing up on the Northern Neck east of Fredericksburg, Virginia, before and during the civil war period, the author mentions an occasion when girls found they were going to be crossing a river on a ferry. When they heard that, they manufactured a quantity of "rag dolls" and, while they were crossing the river, threw the dolls over the rail, pretending they had been shipwrecked and these were the victims drowning. An interesting bit of imagination!! While the young ladies of the 1860's enjoyed their play, we don't recommend that anyone throw their doll off a boat into a river. If desired, the same style doll can be made using brown or black fabric to make a doll of African descent. Immediately following the instructions for making the rolled doll in The American Girl's Book, there were directions for making a black doll. A Rolled Fabric Doll kit is $6.50. The kits are available wholesale. A finished Rolled Fabric Doll is $9.95.